Michael Grimm, tax evasion guilty plea: Staten Island rep will admit to crime. 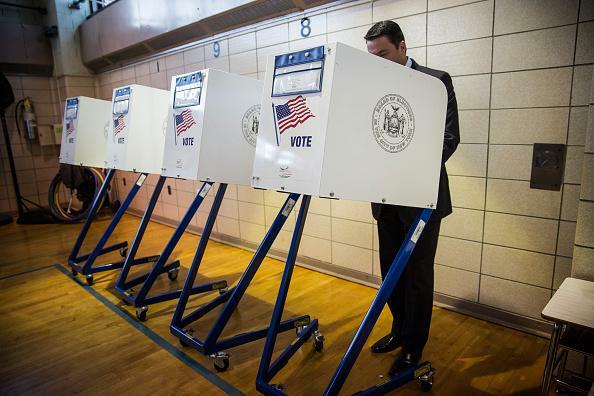 Michael Grimm voting in November. Representative Michael G. Grimm, a Republican from Staten Island who was elected to a second term in November despite having been indicted on federal fraud charges, has agreed to plead guilty to a single felony charge of tax evasion, according to two people with knowledge of the matter. Mr. Grimm, a former Marine and agent with the Federal Bureau of Investigation who first ran for office as a law-and-order corruption fighter, is scheduled to appear in federal court in Brooklyn at 1 p.m. on Tuesday for a plea hearing, according to the docket sheet in his case, which provides no further detail. Grimm, the New York Times writes, has said he will resign if convicted; at this point all that’s standing between him and a conviction is the judge who’ll decide whether to accept his plea. Grimm is evidently a persuasive individual, though, having won an election while under indictment, so maybe he’ll be able to find a loophole in the resignation promise. Further reading: New York magazine’s July piece about a very likable, very well-connected, and seemingly very shady rabbi named Yoshiyahu Yosef Pinto who, among many other mover-and-shaker dealings across the globe, raised money for Grimm and sought his help in resolving a sticky situation involving a U.S. visa application, a hot-tempered New York City publicist, and several hundreds of thousands of dollars.